Alara has spent her life under the radar, hiding her nature from the government and those around her. When it came to a choice of letting her cousin fall into servitude to their own government or live a life free in the stars, Alara stepped into the path of disaster and made sure that Tosha went free. Trapped and locked in a lab where other talents were incarcerated she meets a new friend and the man who has haunted her dreams for the last six months. General Brodin has fought wars and when his talent surged forward, the government of Dhema sent him to the Sector Guard. He has waited patiently to find his true mate, and when he was told to get himself captured on Dalpha he did it without question. Seeing Alara for the first time, he knows why. 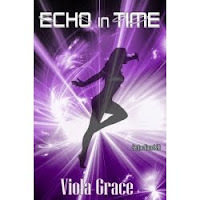 Echo In Time is the twentieth book in Viola Grace’s Sector Guard series, and this is still a world filled with possibilities. The talents of Dalpha are persecuted and imprisoned by their government. Those who can be of use are sent into servitude, while others are kept in the labs for research. When Alara J’Tak realizes that she and her cousin Tosha are in danger of being discovered as talents, she contacts the Alliance with a message for the Sector Guard. She has seen the future for both of them, and she knows Tosha must remain free. Alara knows she will be captured, and sees her future with one very attractive Dhemon in all its possible permutations. When General Brodin is brought to the common room at the lab complex where she is being held, Alara realizes her freedom and a new life with the Guard is imminent. The government is given a chance to make amends to the talents is has abused, and Alara is asked to present the terms to the planet. Can Alara find her place beside Brodin in the Sector Guard? Will her evolving talent be of good use to all concerned? Is she ready to marry the Dhemon that has starred in her future dreams for so long? This story brings back many of the characters from previous adventures, and I enjoyed seeing them all again. I love the imaginative way Ms. Grace creates new worlds and species, and yet makes sure folks will be compatible and comfortable together. I look forward to each new story in this series. Alara J’Tak, or Echo In Time, is a strong and sassy woman, determined to protect the only relative she has left. Her talent for seeing all possible futures is, to her, just a tame and unimportant one. She knows she can survive a short stay in the labs, while her cousin Tosha would be far less able to handle it. I liked seeing how she was able to manipulate life around her to her advantage, using her intelligence along with her talent to get where she needs to be. General Brodin, or Might as he is known in the Sector Guard, is strong and determined to rescue not only Alara, his mate, but also free those talents on Dalpha being restrained. As Commander of Teklan Base, he has waited a long time to find his mate, and is determined not to let anything get in the way of their future together. I enjoyed watching as Alara was able to keep him in suspense at first, and I liked that he didn’t rush her into anything before she was ready. This is a sweet and gentle love story, but there are dangers to be faced from those in control at the lab before Echo and Might can be together. The supporting characters are, for the most part, Sector Guard members that we have met before, performing their duties in support of their Commander. I found this to be a wonderful addition to the ongoing universe of the Sector Guard, and I look forward to visiting with these characters again soon.